Who Was Behind the Cyberattack on Sony? In the rush to judgment, few were asking for evidence, and none was provided. Computer security analysts, however, were vocal in their skepticism. The major problem with the evidence offered by the FBI is that it is self-referential, all of it pointing back to the 2013 attack on South Korean banks and media that was carried out by the DarkSeoul gang. At that time, without supplying any supporting evidence, the United States accused North Korea of being behind DarkSeoul. In effect, the FBI argues that because the U.S. spread the rumor of North Korean involvement in the earlier attack, and some of the code is related, this proves that North Korea is also responsible for the Sony hack. One rumor points to another rumor as ‘proof,’ rendering the argument meaningless. Consider some of the other flaws in the FBI’s statement. The IP addresses that were hard-coded in the malware used in the Sony hack belonged to servers located in Thailand, Poland, Italy, Bolivia, Singapore, Cypress, and the United States. The FBI implies that only the Democratic People’s Republic of Korea (DPRK – the formal name for North Korea) could have used these servers. The Thai port is a proxy that is commonly used in sending spam and malware. The same is true of the Polish and Italian servers. All of the servers used in the Sony attack have been previously compromised and are among the many computers that are widely known and used by hackers and spam distributors. Anyone with the knowhow can use them. Whether or not these machines were used is another matter. Hackers often use proxy machines with phony IP addresses to mislead investigators. No hackers use their own computers to launch an attack. Vulnerable systems are hijacked in order to route traffic. For the FBI to point to IP addresses either reveals a fundamental misunderstanding of cybersecurity or a cynical attempt to deliberately mislead the public. The Sony hack also bears similarities with the 2012 Shamoon cyberattack on computers belonging to Saudi Aramco. Those responsible for that attack have never been identified either, although the United States accused Iran without providing any evidence. Using the FBI’s logic, one could just as easily argue that the Sony hack was the work of Iran. One groundless accusation is used to buttress another. As evidentiary matter, it is worthless. It should also be recalled that in 1998, the United States blamed Iraq for the Solar Sunrise hack into Defense Department computers, only for it be ultimately revealed that it was the act of a few teenagers. Nor do the similarities in code between the Sony hack and the earlier Shamoon and DarkSeoul attacks indicate a shared responsibility. Malware is freely available on the black market. Hackers operate by purchasing or borrowing, and then tweaking commonly available software, including both illegal and legal components. Code is shared among hackers on forums, and malware is assembled by linking various elements together. One of the components used in the Sony cyberattack was the RawDisk library from EldoS, a commercial application that allows direct access to Windows hardware bypassing security. Anyone can legally purchase this software. There is nothing to tie it to the DPRK. Trojan-Destover, the malware used in the Sony cyberattack, included at least six components utilized earlier by Shamoon and DarkSeoul. “Even in such damaging scenarios, the cyber attacker’s tools are reused,” points out Sariel Moshe of CyActive. “For them, if it worked once, tweak it a bit and it will work again. The attack on Sony demonstrates quite clearly that this method works quite well.” Indeed, while Shamoon and DarkSeoul are the most commonly mentioned predecessors to the Sony hack, it is thought that this software has been used on several occasions in the past against multiple targets. Four files used in the attack were compiled on a machine set to the Korean language. That fact proves nothing, notes computer security analyst Chris Davis. “That is pretty weak evidence. I could compile malware code that used Afrikaans and where the timestamp matched JoBerg in about five seconds.” Any reasonably competent hacker would change the language setting in order to misdirect investigators. Had North Korean conducted this attack, it certainly would have taken the basic step of changing the language setting on the machine used to compile code. What about North Korean resentment over Sony Picture’s tasteless lowbrow comedy, The Interview, which portrays the assassination of DPRK leader Kim Jong-un? It is doubtful that Americans would find themselves any more amused by a foreign comedy on the subject of killing a U.S. president than the North Koreans are by The Interview. Among the emails leaked by the cyberattack on Sony was a message from Bruce Bennett of the Rand Corporation. Bennett was a consultant on the film and opposed toning down the film’s ending. “I have been clear that the assassination of Kim Jong-un is the most likely path to a collapse of the North Korean government,” he wrote, adding that DVD leaks of the film into North Korea “will start some real thinking.” In another message, Sony CEO Michael Lynton responded: “Bruce – Spoke to someone very senior in State (confidentially). He agreed with everything you have been saying. Everything.” Lynton was also communicating with Robert King, U.S. Special Envoy for North Korean Human Rights Issues in regard to the film. For two weeks following the cyberattack, the media harped on the subject of North Korean culpability. Only after that point did the Guardians of Peace (GOP) make its first public reference to The Interview, denying any connection with the DPRK. Yet another week passed before the GOP denounced the movie and threatened to attack theaters showing the film. It appears that the narrative of North Korean involvement repeated ad nauseam by the media and the U.S. government presented a gift to the hackers too tempting to pass up. The GOP played to the dominant theme and succeeded in solidifying the tendency to blame the DPRK, with the effect of ensuring that no investigation would pursue the group. For its part, the Obama Administration chose to seize the opportunity to bolster its anti-North Korea policy in preference over tracking down the culprits. There are strong indications that the cyberattack involved one or more disgruntled Sony employees or ex-employees, probably working together with experienced hackers. The malware used against Sony had been modified to include hard-coded file paths and server names. System administrator user names and passwords were also hard-coded. Only someone having full access with system administrator privileges to Sony’s computer network could have obtained this information. 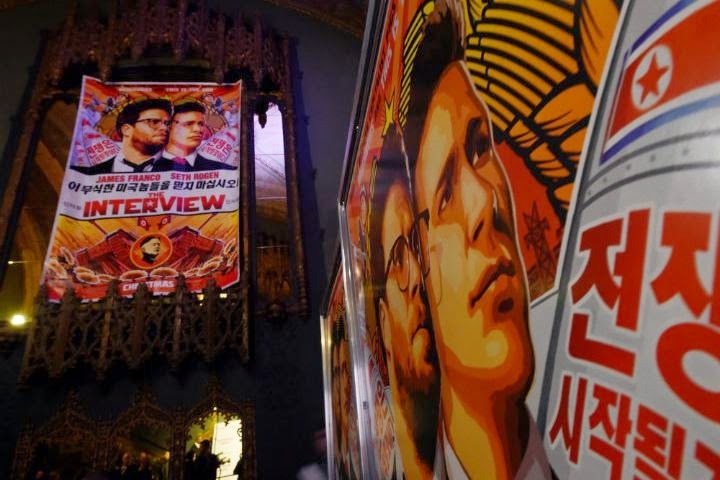 Seeking to diffuse tensions, North Korea proposed to conduct a joint investigation with the United States into the Sony cyberattack. Predictably, the United States quickly rebuffed the offer. National Security Council spokesman Mark Stroh arrogantly responded, “If the North Korean government wants to help, they can admit their culpability and compensate Sony for the damages this attack caused.” North Korea can hardly be expected to accept blame for an act it did not commit. But getting to the truth of the matter was the farthest thing from the Obama Administration’s mind. Similarly, U.S. officials are ignoring requests from cybersecurity experts to be allowed to analyze the Destover code. “They’re worried we’ll prove them wrong,” Robert Graham concludes. Contrast the mild treatment the media gave to the recent large-scale hacks into Target, Home Depot and JP Morgan, in which millions of credit cards and personal information were stolen, with the coverage of the cyberattack on Sony Pictures. It is impossible to avoid the conclusion that political considerations are driving the media furor over the latter case. After six years in office, the Obama Administration has yet to engage in dialogue or diplomacy with North Korea. It prefers to maintain a wall of hostility, blocking any prospect of progress or understanding between the two nations. Already, North Korean websites have been targeted by persistent denial of service operations. Whether the attacks were launched by a U.S. government cyber team or independent hackers inspired by media reports is not known. In any case, President Obama has already promised to take unspecified action against the DPRK. Actual responsibility for the Sony attack is irrelevant. Backed by media cheerleading, U.S officials are using the cyberattack as a pretext to ratchet up pressure on North Korea. Any action the Obama Administration takes is likely to trigger a response, and we could enter a dangerous feedback loop of action/counteraction. Gregory Elich is on the Board of Directors of the Jasenovac Research Institute and the Advisory Board of the Korea Policy Institute. He is a member of the Committee to Defend Democracy in South Korea and a columnist for Voice of the People. He is also one of the co-authors of Killing Democracy: CIA and Pentagon Operations in the Post-Soviet Period, published in the Russian language. Gregory Elich is on the Board of Directors of the Jasenovac Research Institute and the Advisory Board of the Korea Policy Institute. He is a member of the Committee to Defend Democracy in South Korea and a columnist for Voice of the People. He is also one of the co-authors ofKilling Democracy: CIA and Pentagon Operations in the Post-Soviet Period, published in the Russian language. Nana’s Christmas Rant "Christmas & the New Age Movement"